The oil is extracted by means of steam distillation in an easier way. The chemical Chemical Composition camomile oil includes Esters, Pinene, Fanesol, Nerolidol, Chamazulene, Pinocarvone, Cineol. These oils are excellent for protecting dry skin an thus provide a soothing effect on mind and body. The Featuring a sweet, apple-like fragrance, CHAMOMILE OIL (chamomile roman oil) is light clear blue in color with a watery viscosity. These are highly effective for irritation, impatience and feeling disagreeable. Camomile essential oil has a sweet, apple-like fragrance and belongs to species Asteraceae. Light clear blue in color with a watery viscosity, this oil is sweet and is a a powerful anti-inflammatory agent. 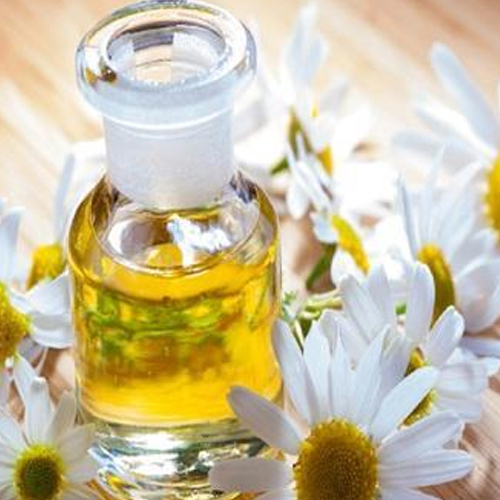 CHAMOMILE OIL is widely used in day to day activities in various applications like mouthwashes, lotions and creams. Moreover, the oil is also used to relieve allergies, anorexia, addiction, colic, insomnia, back pain, muscle pain, arthritis, post-natal depression and bowel disorders., Howveer,. Thes are highly recommended for those who are suffering from asthma, measles, mumps, PMS, menopausal symptoms as well as rheumatism. The therapeuticproperties include analgesic, anti-infectious, anti-depressant, anti-neuralgic, antiphlogistic, antiseptic, antispasmodic, anti-spasmodic, antiseptic, antibiotic, anti-inflammatory, bactericidal, carminative, cholagogue, cicatrisant, emmenagogue, febrifuge, hepatic, sedative, nervine, digestive, tonic, sudorific, stomachic, vermifuge and vulnerary. The camomile oil is blend well with bergamot, clary sage, lavender, geranium, jasmine, tea tree, grapefruit, rose, lemon and ylang-ylang. Known for stimulating the liver and gall bladder, these oils are highly recommended by doctors. These have an excellent calming properties and thus helps in treating PMS and other menstrual and menopausal problems. Having fine, feathery leaves with tiny white or yellow centered daisy like flowers, these oils blends well with rose, geranium and lavender. These oils are not recommended for pregnant women because these are considered as a non-toxic and non-irritant.